Celebrate Kids offers a place where children from Kindergarten through 5th grade can discover and develop a relationship with Jesus Christ and learn that He has a special plan just for them. We offer children a dynamic, high energy "children's church" worship service with fun kids songs and loveable characters as well as an individual class time experience. Kids get the best of both worlds and the weekly lesson is taught in both the corporate and individual setting to make sure children learn in the environment that suits them best. Our aim in Celebrate Kids is to partner with parents in their child's faith formation, not replace that critical interaction. Our children's services are fully staffed with adults and youth volunteers who are committed to teaching and ministering to children. You can be confident that your child is well cared for and having a great time learning about God while you worship. Celebrate Kids Ministry is offered during all Celebration services. Parents! How many times have you got in the car and asked your kids “what did you learn in church today?” Only to hear the reply “I don’t know?” Celebrate Kids believes in equipping the saints to fulfill the calling of God on their lives and we know that “the saints” includes your little world changer too! 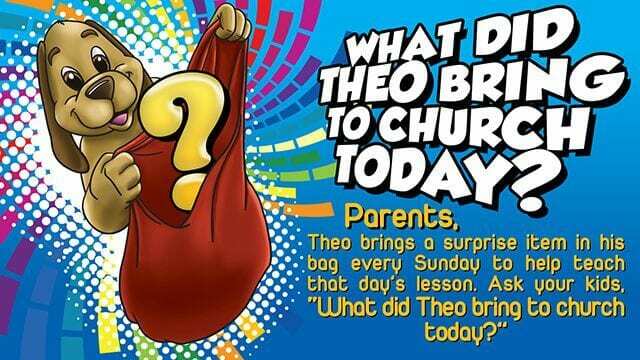 Asking your children “what did Theo bring to church today?” Is a great way to begin a conversation between parents and their kids about the spiritual truths they learn at church each week. Your child’s safety is very important to us. Make the Check-In terminal your first stop before taking your children to class. The Check-In terminal is located in the main lobby on the left as you enter. Our nursery is staffed with highly trained, loving people who are committed to making sure our children and parents have a positive experience while at church. Our preschoolers experience wonderful programming which includes energetic praise and worship, “Theo” our lovable children’s mascot storytelling time, crafts and snack. Celebrate Kids believes in teaching the truth of God’s Word in the most fun, creative and memorable ways possible. You can expect high energy worship and captivating teaching that is sure to spark the imagination and excite your children about attending church! Theo The Dog, our lovable mascot, brings something unique in his bag to help us remember our lesson each Sunday. Each week – we challenge parents to ask their children: “What did Theo bring to church today?” This will start a conversation that will help parents guide their children through foundational Biblical truths taught each week in Celebrate Kids. Church community begins at the earliest stages of childhood development and we reinforce that by applying our Bible lesson in a small group format even for our little world changers! Led by a Dream Team member and an assistant known as a guardian we help students not just listen but apply and respond to what they have learned. Join the Generations Dream Team! Celebrate Kids is committed to raising up our children to learn the truth of God’s word, learn the plans and purpose God has for our lives and to have lots of fun along the way! Come and be apart of the journey! STEP 2: Download and fill out the Teacher Packet then either scan it and email it to generations@woodlandscelebration.com or please turn it in signed to Celebrate Kids staff. Is Your Child Interested in Joining the Kids Worship Dept.? Please fill out the form below for information about your child joining the Kids Worship Department at Celebration. It is out goal at Celebration Church to raise up a new generation of passionate worshippers. We are very excited to be partnering with you as we guide our kids into the love of music and change the world through the ministry of worship!